What separates good sushi from great sushi? 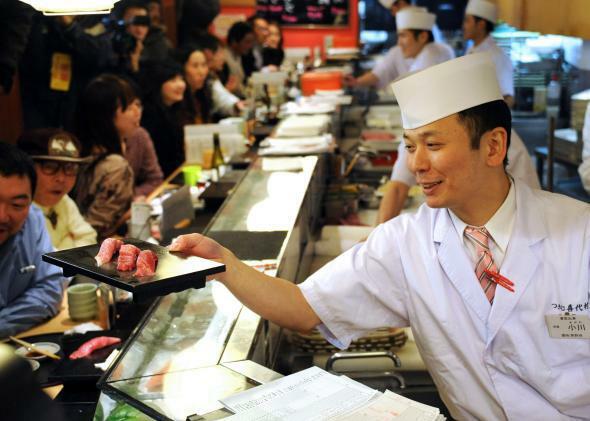 A sushi chef serves up tuna sushi at the popular Japanese chain Sushi-Zanmai in Tokyo in 2013. No attitude or pretense. All of the above places are fun to eat at, with the sushi chef actively engaging with customers, ensuring they are having a good time. Rice. Its temperature, acidity (amount of vinegar), texture, doneness, evenness of mold, consistency of pieces. Timing. Sushi has a rhythm, an even pace between courses. A well-timed sushi meal should last no more than an hour. No tables. Once a piece of sushi is prepared, it must be eaten immediately (within 15 seconds) before the temperature of the rice cools, the temperature of the fish rises, and the rice begins to get soggy. This type of service can only be achieved at the bar where the chef hands off each piece of sushi. Preapplied soy sauce. It’s the chef’s responsibility to sauce each piece of fish moments before handing it to you. Variety. Lots of different animals from the sea: clams, urchin, shrimp, white fish, red fish, eggs, etc. Various cuts of the same fish. This is particularly important with tuna, where lean, medium fatty, and very fatty cuts have very different flavors and textures. Also with different types of shrimp (mantis shrimp, sweet shrimp, botan shrimp). In the U,S., I think there’s a correlation between a sushi restaurant’s dessert menu and authenticity. The above places serve a simple slice of fruit or melon for dessert. If the dessert choices are red bean or green tea ice cream, the menu has been tempered to suit a non-Japanese palate. Sushi: Is there a difference between caviar from a jar and the roe served with sushi? Japanese Food: What are the pro and cons of eating with chopsticks? Sushi: How is wasabi made?